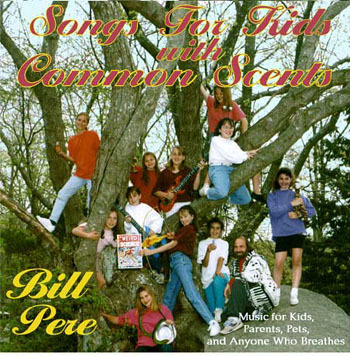 "I'm really glad I got this CD, as it helped connect better with my son"
Songs For Kids With Common Scents is Bill's second collection of songs, designed to foster positive discussion and interaction between kids and their parents. The songs pick up some of the characters and stories from the preceding CD ("Songs for Kids Who Like to Think") and start to develop new story lines which are carried over into the third CD of the series, "Songs For Kids Who Touch the Stars". But, in Bill's typical cinematic style, all the songs stand along, as well as interweave with very tight cross-references to each other. There is dialog between the songs, with lots of puns and wordplay, (featuring the Lunch kids) which make the whole thing seem like acts in a play. "The Wish", one of Bill's very best story songs, appealing equally to children and adults, was selected for inclusion on the "Artists Against Hunger" compilation CD called "The Time is Now". "The Singer and His Son" paints a tender portrait of the relation ship between parent and child, as a child grows up. "House of Ideas" is another of Bill's sensitive songs about children who learn differently in school, "Seventeen Giraffes is unique song about a math problem, with an important message, and Electric Nose is totally off the wall fun. This collection is fun for kids, parents, pets, and anyone who breathes…..
13 Tracks, 51 minutes, Lyric Sheet Included ! Songs For Kids With Common Scents is part of Bill's children's collection, which also includes "Songs For Kids Who Like to Think", "Songs For Kids Who Touch the Stars", "Profiles of Connecticut", and the yet-to -be released "Songs for Kids Who Dare to Dream "